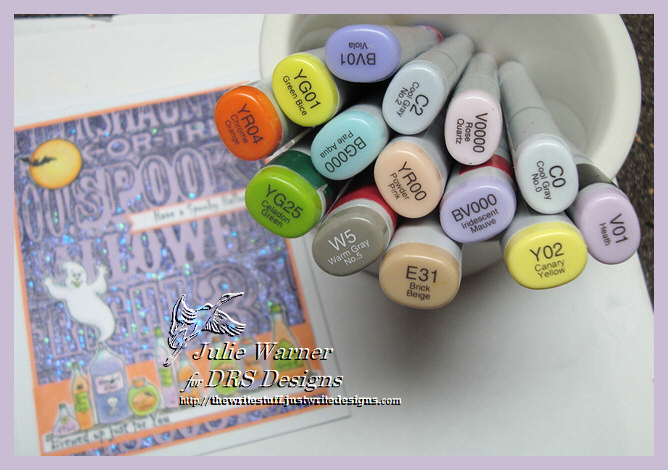 The Free for All Challenge (F4A294) today is to use at least 2 shades of purple. Purple is one of my favorite colors to use for Halloween. 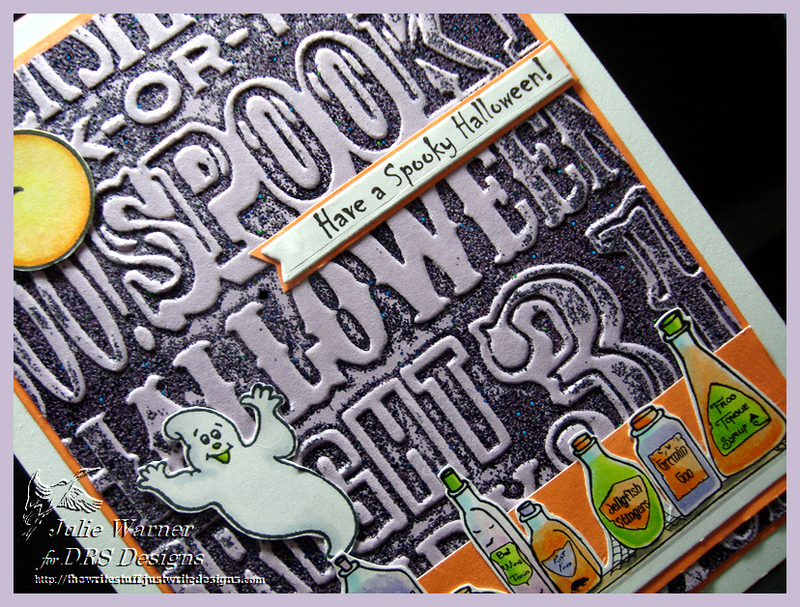 For my spooky card, I started with an embossing folder I just bought & couldn’t wait to give it a test drive. Don’t know if you’ve noticed, but these ef’s made by Sizzix just seem to emboss way deeper than a lot of other brands. So I had a piece of lavender card stock & I inked up the embossing folder w/ some dark purple pigment ink, put my c/s in & embossed it. Then I took it out, sprinkled it with some sparkly dark purple embossing powder & heat embossed it (aka embossed embossing). Wish you could see it..it is really sparkly! The potions were stamped, colored with Copics & I fussy cut around the tops before adding a bright orange strip behind them. The ghost & moon were fussy cut & the greeting was split in two…the first line was fussy cut & added below the the potions & the second line was die cut & added higher up. Here’s a look at the inside & below it are the Copics I used. 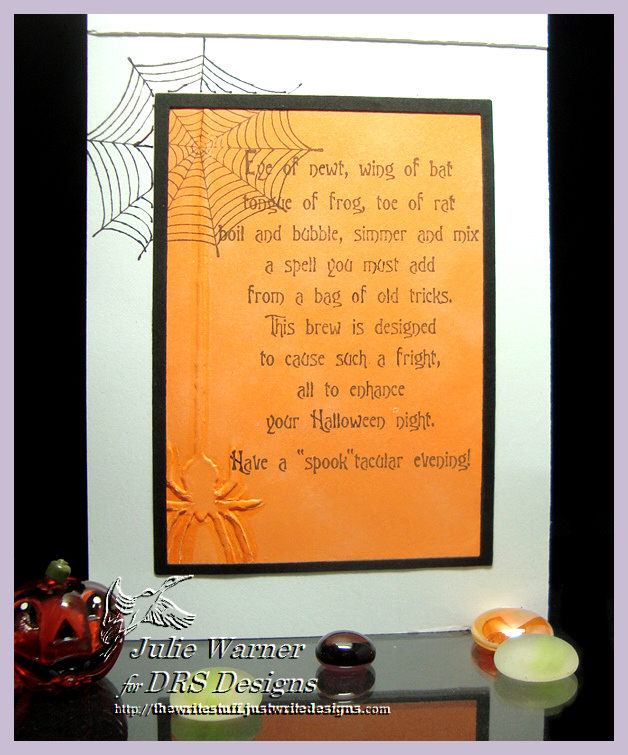 The embossed spider down the left is one of the border folders that came w/ the one I used on the front. Thanks so much for stopping by! 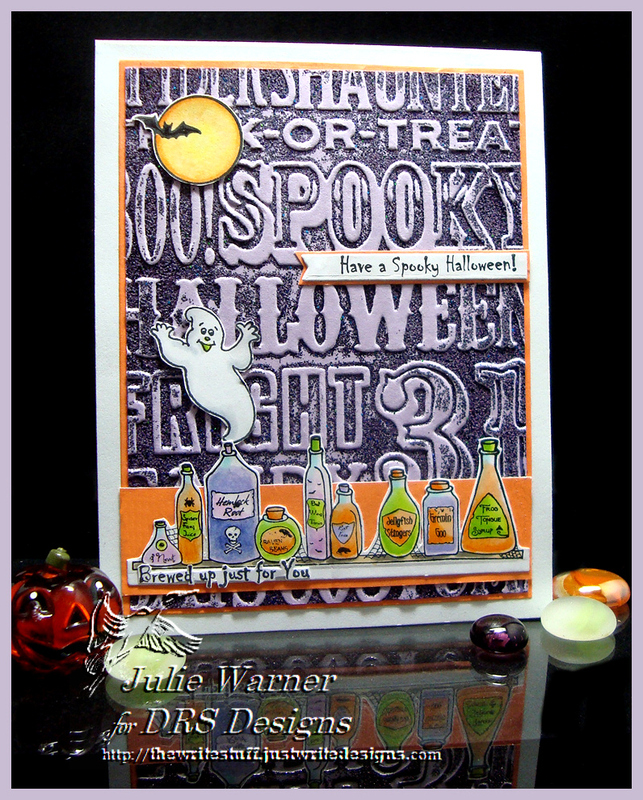 Be sure to check out the DRS Thursday Challenge…this week, make a Spooky or Cutesy Halloween card. 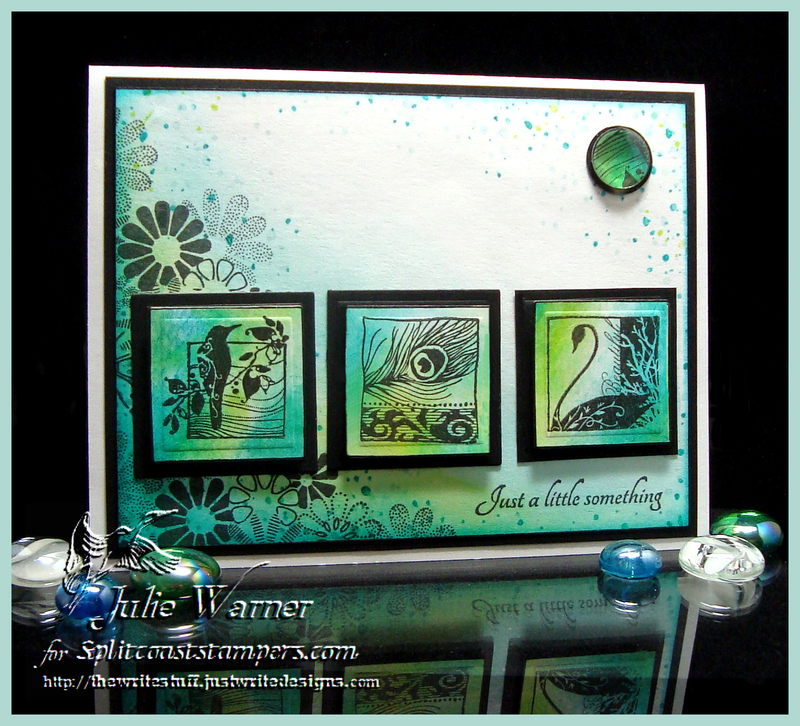 Congrats to Heather, the Featured Stamper on Splitcoast (FS374)! What a wonderful gallery! After much browsing, I finally chose her Triple Snowflakes to case. I kept the lovely layout and small squares, but changed the colors, the images and added a couple of layers. The background layer was sponged with several colors from the Kaleidacolor ink pad, the I used a random dot image (Anita’s) on top in the same colors. The flower image (Judikins) was stamped on the left side and I sponged around the edges. The sentiment (Our Daily Bread designs) was added in the lower right corner. 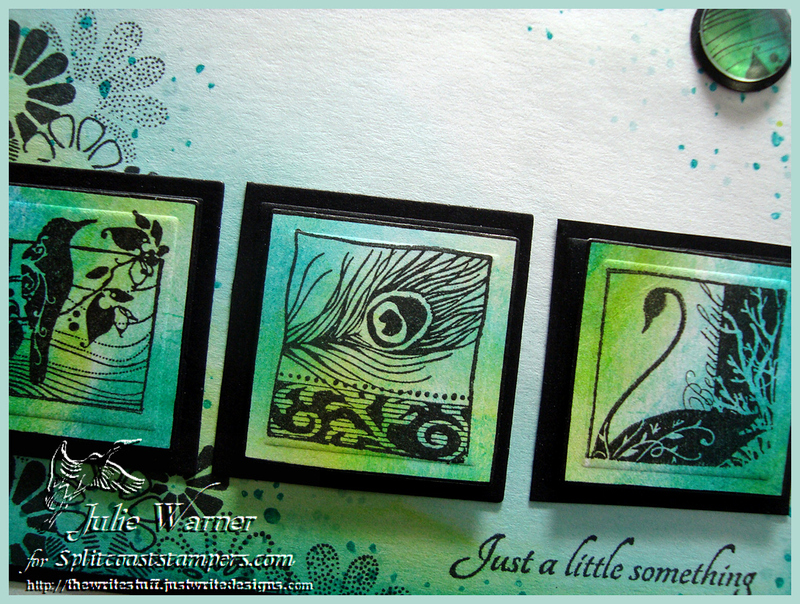 The little bird squares (Mike’s $/Studio 112/K&Co) were stamped on top of a separate piece which was also sponged. They were die cut w/ Spellbinders square dies as were the black squares behind them. I used a 1/2 inch circle punch to punch out a piece of an extra stamped square and a 5/8 inch circle punch for the black circle and attached them in the upper right corner and put a clear epoxy half round on top. The finished card is 5.50 x 4.25.